The complexity of metabolic networks would appear to fit in more appropriately with a cacophonic scenario than anything remotely musical. However, this talk will attempt to show that a mathematical view can be had of this complex process in which the phenomenon of metabolic regulation can be likened to the conductor of a symphonic orchestra summoning combinations of instruments representing metabolic reactions towards superlative music. It will be the objective of this seminar to let this analogy lead the discussion of a cybernetic theory of cellular metabolism which interprets the diversity of gene expression as a targeted effort to maximize the organism’s survival. Dr. Doraiswami (Ramki) Ramkrishna is H. C. Peffer Distinguished Professor of Chemical Engineering at Purdue University since 1994. Since receiving his B.(Chem).Eng. from the University of Bombay in 1960, he obtained his PhD from the University of Minnesota in 1965. 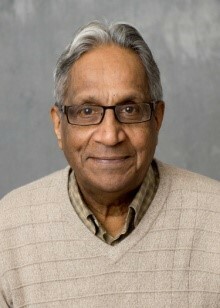 After two years of being an Assistant Professor at the University of Minnesota, he joined the faculty at the Indian Institute of Technology at Kanpur, India where he served until 1974. Following two years of visiting appointments at the Universities of Wisconsin and Minnesota, he joined as a Full Professor of Chemical Engineering at Purdue University in 1976. Dr. Ramkrishna’s research interests are in the application of mathematics to chemical and biochemical reaction engineering, particulate processes and biomedical engineering His research in the biological area encompasses applications of population balances, cybernetic modeling of metabolic systems, metabolic engineering, and modeling of cancer therapy. He has published over 240 papers, two books, and directed close to 40 PhD’s and numerous post-docs. He has had numerous recognitions from various professional societies. He has won the AIChE: Alpha Chi Sigma (1987), Wilhelm Reaction Engineering (1998), and the Thomas Baron (2004) awards. The Humboldt Foundation honored him with the the Senior Humboldt Award (2000) for collaboration with the Max Planck Institute, Magdeburg, Germany. He is a Fellow of several professional societies; AIMBE (1996), IIChE (2001) and AIChE (2007). He has been recognized by his alma mater with the UDCT Diamond Award (1994), an Honorary Doctor of Science degree from the University of Minnesota in 2004, the Jewel of Ruia Award (2006) from Ruia College, and the Platinum Award (2009) from Bombay University. Purdue University has honored him with the College of Engineering Research Excellence Award (2005), Mentoring Award (2010), and the Sigma Xi Local Chapter Faculty Research Award (2013). He has held Distinguished Visiting Professorships from the University of Minnesota (George T. Percy: Fall, 1988), the University of Notre Dame (Melchor: Fall 1994), and the Dow Sharma Distinguished Fellow from Bombay University in 1994. He has delivered numerous Distinguished lectures. He was elected to the US National Academy in 2009 and as a Foreign Fellow of the Indian National Academy of Engineering in 2011.